Photo 1 The acropolis from the north in the 1920’s. Photo in the Asine Archive. 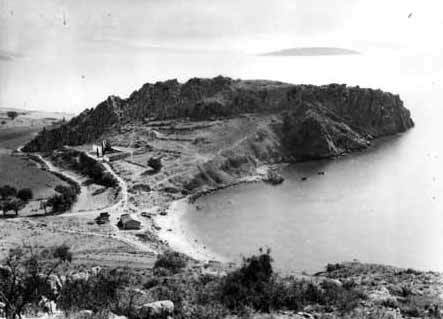 Photo 2 The acropolis with the Hellenistic fortifications seen in the 1920’s from the east. Photo in the Asine Archive. In the ship’s catalogue in the Iliad, Homer informs us who sent ships to the Trojan War. In connection with the Argolid he notes that Asine, situated at the head of the bay, sent six ships. This Asine has been identified with modern day Kastraki near the village of Tolo. The Swedish Crown Prince Gustaf Adolf came here in 1920 on a private tour of Greece. One of the reasons for his choice of country was his interest in archaeology. He had already participated in archaeological excavations in Sweden and believed that Sweden should join in investigating ancient Greece. He was the initiator of the Asine excavations, Sweden’s first excavation on a large scale in the country. For nearly two decades, until the outbreak of the Second World War, Swedish archaeologists worked extensively in the Argolid and always under the direction of Axel W. Persson. He was Swedish archaeology in Greece. As he was not a field archaeologist but a philologist the Asine Committee appointed Otto Frödin, an experienced field archaeologist to direct the fieldwork together with Persson. When the publication appeared in 1938 (Results of the Swedish excavation at Asine 1922 – 1930) in Stockholm it reflected the main interest of the two directors as well as the focus of archaeological research at the time: prehistory. Extensive investigations were carried out on the acropolis and in the so-called Lower Town or the northern slopes of the rock. Further, on the Barbouna Hill two cemeteries were partly investigated: a Late Bronze Age one (c. 1600 -1100 BC) on the eastern slopes and a Late Geometric one (8th century BC) on the south slopes.Methodologically the excavations were very advanced. Much of the soil was sieved in order not to miss small objects and all material was considered important enough to keep. A large sherd collection is now kept in the Asine Collection at the University of Uppsala as a result of an exchange of materials done in the 1930’s between the Swedish Asine Committee and the Greek government. From several Swedish museums prehistoric flint tools and weapons were given to Greece. In 1970 investigations at Asine were resumed by the Swedish Institute at Athens under the direction of Carl-Gustaf Styrenius, its director at the time. The brothers Karmaniola who owned land east of the acropolis wished to build a camping-place and test trenches by the local archaeological authorities indicated extensive ancient remains. A year later Robin Hägg joined the project and the southern slopes of the Barbouna Hill were included in the investigations. The Karmaniola area was excavated from 1970 – 1974 and is today mostly published (in the Acta of the institute); Hägg did his last field season in 1989. The results of the work on Barbouna are partly published in a periodical of Uppsala University: Boreas. 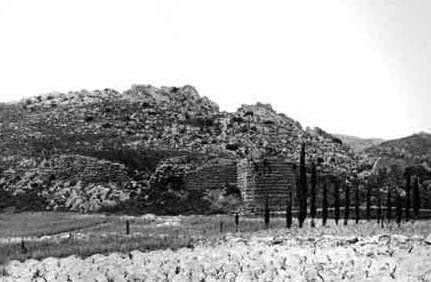 In 1985 Berit Wells investigated the Late Geometric walls on the northern slopes of the Barbouna Hill (‘Early Greek building sacrifices’ in Early Greek cult practice, eds. R. Hägg, N. Marinatos and G.C. 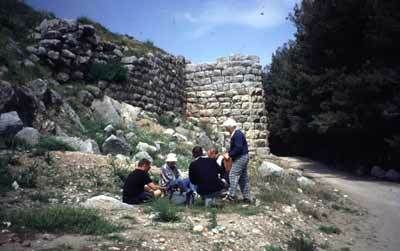 Nordquist, Stockholm 1988) and in 1990 the previously unexcavated corner north of the Hellenistic bastion (A. Penttinen, ‘Excavations on the acropolis of Asine in 1990’, Opuscula Atheniensia, 1966). At present no fieldwork is being carried out at Asine. At all times Asine was a site of strategic importance. This is today reflected in the Hellenistic fortifications built by the Macedonians (probably by Demetrios Poliorketes) c. 300 BC and in the trenches and guard towers built by the Italian army during the occupation of Greece in the Second World War. There is more or less continuous habitation at Asine from the Neolithic period onwards. The place flourished through the Bronze Age and continued doing so also after the destruction of the Mycenaean citadels and into the early Iron Age. Not until c. 700, when Argos destroyed Asine, do we see a decline in settlement but not a discontinuance as was proposed in the old publication. People continued living here and c. 300 BC there was a re-colonization, when the above-mentioned fortifications were built. About the later history we catch only glimpses. In the Late Roman period (c. 400 – 500 BC) at least one bath was erected; in 1686 Morosini landed on the eve of the capture of Nauplion; and after the War of Independence Cretan fishermen attacked and destroyed a still Ottoman village (according to tradition) on the island of Romvi. They settled on the shore opposite and founded the village of Tolo.